Ski-in, ski-out. Slope-side sleeping spots are often the holy grail of high-elevation real estate, and here at Lake Tahoe, with limited such options available, the quest can be even keener. With winter’s return to the Sierra, the Glades Ski House, tucked into the fall line of Northstar California, is a prime place for snow sports enthusiasts to hang their boards. Mind you, this pretty piece of property is no backcountry cabin. 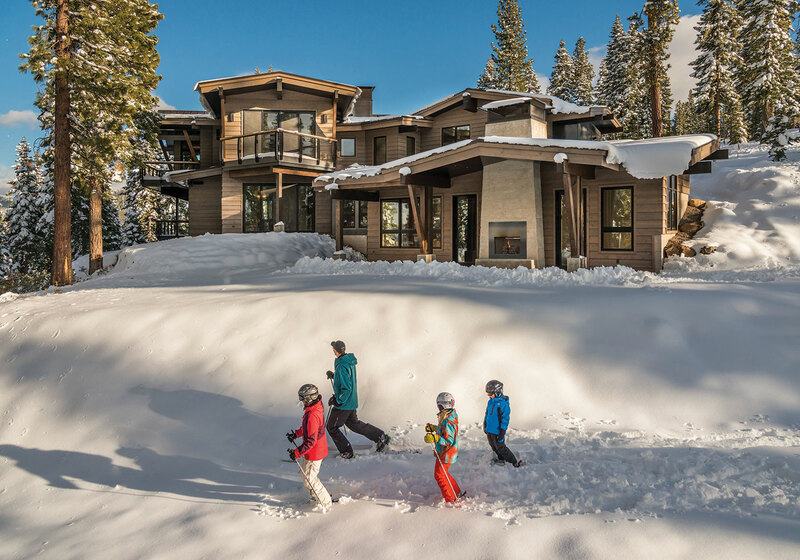 The first home to be built in the exclusive Martis 25 subdivision of Mountainside at Northstar, with direct access to the ski resort as well as the Ritz-Carlton, Lake Tahoe, this 7,910 square foot, mountain modern, lodge-like custom home boasts six en-suite bedrooms and commanding views from Castle Peak to the Carson Range. 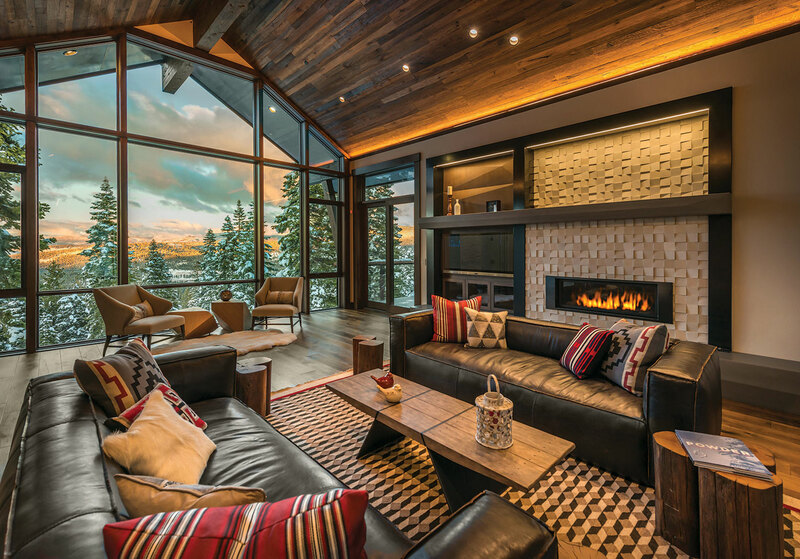 Owner Greg Cecchi, who has an affinity for remodeling homes, and architect Lezley Jerome Barclay traveled to high-end, high-altitude developments in Beaver Creek, Vail and Deer Valley to identify the most successful and appealing ski-in, ski-out designs. After looking at several Martis 25 lots, Barclay hiked and snowshoed the selected .76 acre site several times to thoroughly visualize the plans. The Glades Ski House’s attached warming hut, which is hardly a hut, is in many ways the heart of the house and, quite literally, the start of the house. The first part of the project to be built, the 800 square foot self-contained, flexible-use space lies 12 feet below grade, low enough to ski in and out the hut’s back door off Northstar’s Timberline run; the resort’s newly installed Timberline triple chair provides access to mid-mountain. And while the whole house, which is neatly wrapped in western red cedar, works with the slope to sit down into the lot, this shed-roofed space seems to do that particularly well. But that was not without a little unusual developer dispensation. The warming hut can be locked off and accessed separately from the main part of the house so friends and family can come and go as powder days beckon. Rust-toned stained radiant-heated concrete floors hold up well to the wear and tear of boot traffic. The board-formed concrete, gas-fueled fireplace (two of seven throughout the house) puts the warm in warming hut. Dual hearths face inside and out, helpful for those hasty hot tub exits, as is the snow-melt system below the patio. Here and across the house, interior and exterior walls are insulated for sound and heat. Behind a sliding barn door an equipment room has ski/board storage with built-in drainage below; benches make it easy to boot on and off, and cubbies, shelves and hooks provide the required space for stowing all matter of gear. The small window at the top of the room provides one of Barclay’s signature moves: tapping natural light sources whenever possible. A handsome curved walnut countertop serves as a gathering and focal point, doubling as both a bar and defining line for a kitchenette area complete with iridescent shell tile mosaic backsplash, custom walnut cabinetry by Victory Woodworks of Reno, convection microwave, dishwasher, fridge and, maybe most importantly, ice maker. A small trio of cylindrical glass pendant lighting hangs from above. 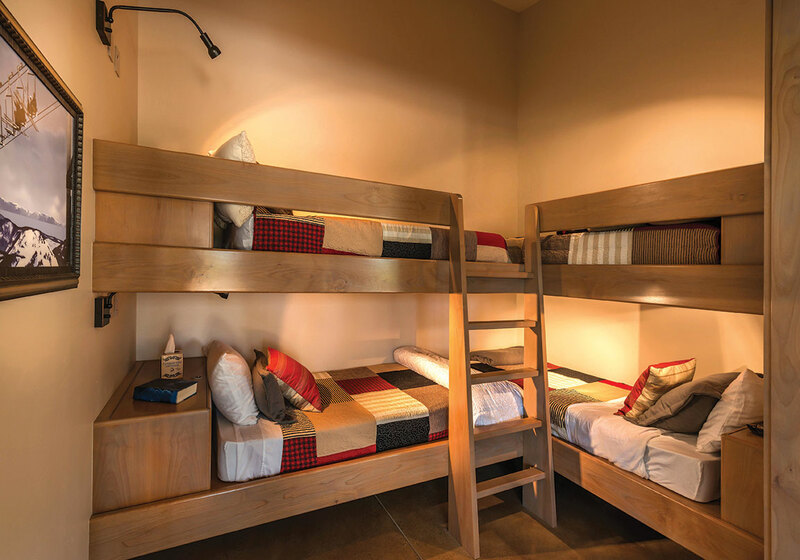 For the weary, the Pullman-like bunkroom that can be curtained off from the main living area boasts four sturdy stacked built-in beds for relaxing, napping or overnight accommodations. Naturally, it’s also a kids’ favorite hangout/hideout. The cozy confines of the warming hut are connected to the rest of the residence by a narrow—and the home’s only—hallway. “I don’t like to waste the space on them,” says Barclay. In this case, the corridor provides a protected passage and “the sense that you’re going to a different place,” she adds. Branching off the hallway is secondary staircase providing easy access to the main floor of the house, while a bit farther along leads to a wet room/laundry room with space for a sauna, which can be closed away behind another substantial sliding barn door. The nearby family/game room, which is built to accommodate a pool table, features foldaway glass doors for deck and outdoor access. Relief-cut concrete floors allow for expansion, easy heating and low maintenance. The wet bar leads to a wine cellar, dug into the mountainside for natural climate control; a pair of simple clear cylindrical glass pendants hangs above the honed black granite counter. Four of the whimsical six master suites are located on this main level. The suites are designed to host any number of configurations of visiting friends and families with adult or young children. One of the suites, for example, has bunk beds and a bathroom that can manage four kids at a time using a set of regular and kid-friendly height sinks, enclosed toilet and separate shower and tub. The downstairs connects to the main floor via a stairwell made from steel and 16 etched light-catching panes of glass designed by interior designer Marcio Decker, co-owner of Truckee’s Aspen Leaf Interiors. 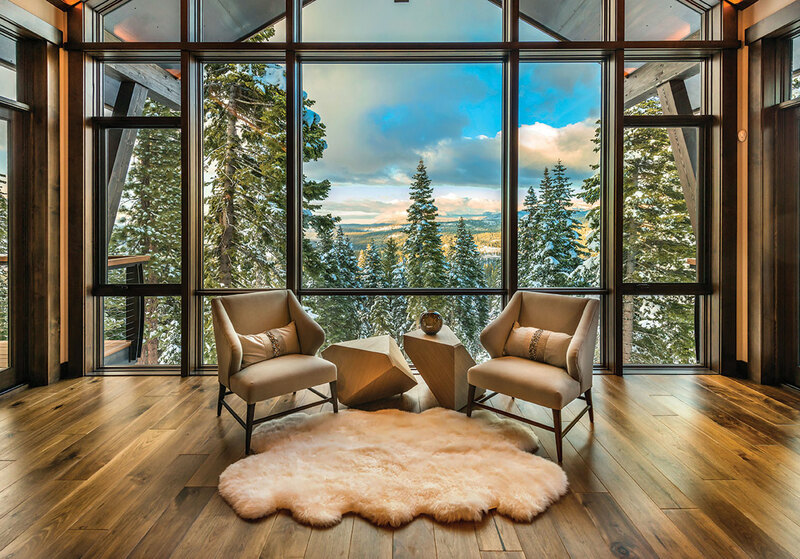 And while the form and function of this section of the house is stunning, it is the panoramic vistas from the Sierra to the Carson Range out the north-facing walls of glass that remind you why you’re here—and why you won’t want to leave. The imposing view makes for a grand entrance as guests arrive via the leathered black granite pathway, walk past the hot-rolled steel fireplace and oversized steel pivot door, and into a great room where that immense landscape remains a visible theme regardless of vantage point. “In addition to the spectacular views, we picked this lot because of the privacy factor,” says Barclay. “There are no neighboring houses in the way.” The flanking decks to the side of the main window wall means no caps, rails, pickets or planks adulterate the changing scenery of incoming storms and alpenglow. The roofline’s cantilevered corners need no visually distracting support posts either. Dark-stained glulam and steel beams, the longest of which is 32 feet, are unwrapped to show off the home’s true structural elements. In this great open space, Decker’s deft interior design touches are most apparent. The lofty ceiling is paneled with DuChateau, Heritage Timber Edition European oak, 7 7⁄16-inch wide planks, a carbonized, deep brushed, salvaged material with natural hard wax oil finish. Underfoot are similarly sized and treated walnut boards. A low-slung, ribbon-style fireplace surrounded by canted limestone blocks creates a woven effect, and the beveled concrete hearth and mantle fabricated and installed by Clastic Designs out of Sparks also make for strong lines. “Like snowflakes, this house reflects a level of abstraction in terms of patterns, colors and angles—complex patterns but a neutral palette,” says Decker. This is perhaps best seen in the home’s repeated motif of a geometric flattened pyramid pattern, primarily in the deep copper tones of the decorative steel fabricated by Truckee’s Heavy Metal Customs. In the commercial-grade kitchen, where the dark stained rift-cut white oak cabinetry contrasts with the creamy hued marble countertop, the pattern plays out in the ventilation hood as well as the ceramic tile backsplash below. A very functional mudroom lined with vintage Tahoe photos allows easy and informal family access via the three-car garage. Another laundry room stands by. The master suite gets equally sweet views, both from the sitting area around the steel pyramid-topped ribbon hearth and from the private deck. The spacious bath boasts a freestanding tub with floor-to-ceiling views of the glades outside. A flex suite across the great room can be used for an office or bedroom. Cecchi, whose electrical and professional engineering firm focuses on home automation and energy efficiency for industry and large homes, had a natural inclination to incorporate the smartest technology available. 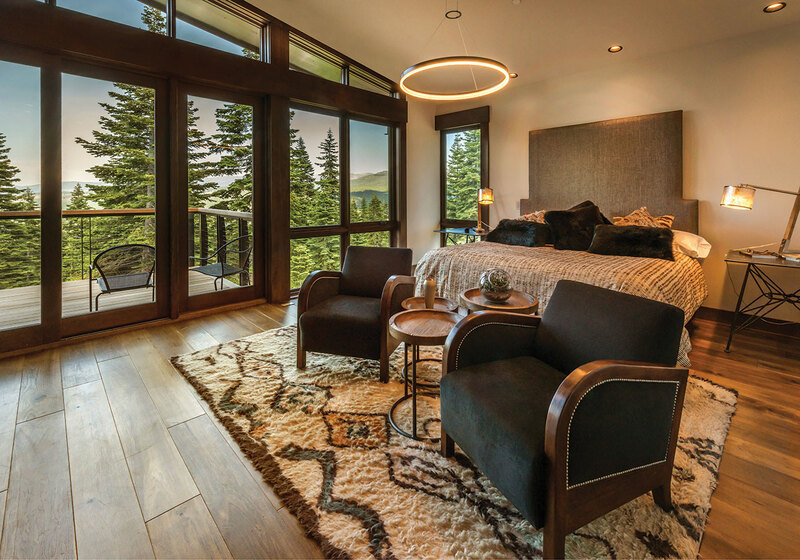 Ninety-five percent of the lighting is via a Lutron Ivalo collection LED system that can be dimmed with ecosystem drivers to one percent. Lutron window blinds/solar shades disappear into the ceiling on command. Radiant and hydronic heat systems are split into 13 separate zones. All are wireless and programmable via removable iPads installed in place of conventional thermostats. Verdi Energy and Opulent Energy teamed to provide the home’s automated systems. And, while not always the case from many an owner’s perspective, assembled efficiently as well. 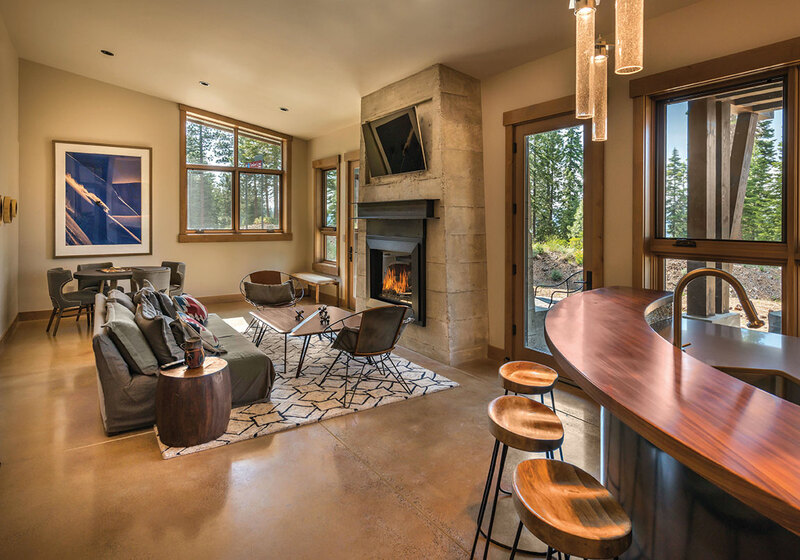 “Wood Ridge built a very efficient custom home of the highest quality while ensuring work was completed on time,” says Cecchi. Which brings us back to the beginning of the house—that warming hut. It can be yours for the asking price of $9,300,000. The good news is that it comes with a lovely home.